A Year of Being Here: Tere Sievers: "These Things A Prayer"
"These Things A Prayer" by Tere Sievers. Published here by poet submission. © Tere Sievers. 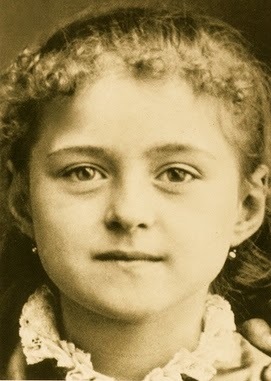 Art credit: St. Theresa of Lisieux as a child by unknown photographer (originally black and white). She was my favorite saint, too. I discovered her at 16--me a boy and athletic with devotion. She was mischievous, courageous and intense. Something came alive in me, reading her life. Something deeper even than my repressed sexuality. It is still there.